The political leadership of the Libyan and Maltese Governments of the time felt that it would be socio-economically viable which would be mutually beneficial to both the respective Countries. From such a background emerged the idea of setting up an aviation company. This led to a promoters’ meeting between Mr. Albert Mizzi, then Chairman of Air Malta, Mr. Hassan Cuniali, then Chairman of Libyan Arab Airlines, Mr. Carmelo Vella and Mr. Mohammed Abduljawad, then Managing Director and Chairman of the Libyan Arab Maltese Holding Company respectively. During this meeting it was decided that Dr. Amin Marghani be commissioned to prepare the necessary feasibility studies and business plans as the first steps to bring the seeds of this idea into fruition. The business plan was eventually followed up by an action plan prepared by the persons responsible for the task force – Mr. Abdurazagh Zmirli and Mr. Mohamed Elalem – then joint Managing Director of the Libyan Arab Maltese Holding Company. The task force was also ably assisted by Mr. Mohamed Issa then Area Manager of the Libyan Arab Airlines based in Malta. 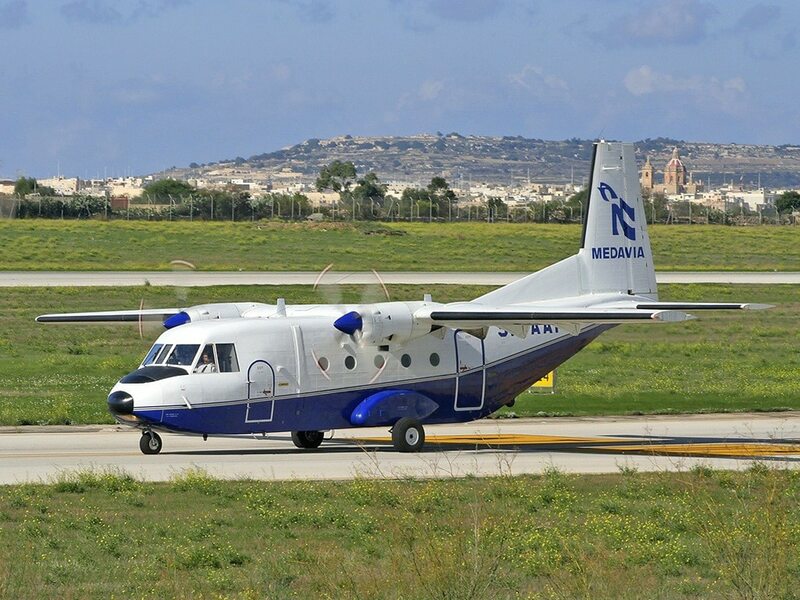 Mediterranean Aviation Company Ltd. or Medavia as it became popularly known was established on 21st August 1978. At its inception, Medavia had a very specific scope of activity focused around providing customised air transportation services to the Libyan oil industry. Although some of the oil companies, such as Zueitina and Waha Oil Company had their own aviation departments to operate light aircraft, others such as AGOCO preferred to lease in this specialised service rather than develop an in-house capability. The oil companies also subcontracted certain activities such as seismic survey and exploration. The selection of an aircraft type is crucial decision in the life cycle of any air transport undertaking but much more so in the start-up phase. The Board of Directors selected the De Havilland DHC-6-300 “Twin Otter” a 16 seat turbo-prop aircraft as best suited to meet the Libyan oil sector market requirements. There were several examples of this aircraft type already in operation in Libya. The aircraft had proved its reliability in service in the technically hostile, hot, desert environment. Mr. Muftah Abuhajar, Medavia’s first Managing Director signed purchase agreements for two “Twin Otter” aircraft. While the aircraft were in assembly at the De Havilland factory at Downswiew, Canada Medavia’s own infrastructure had to be build from scratch, and charter contracts secured for these new aircraft. At the outset the marketing strategy was to sell the aircraft on a “whole aircraft” charter baseis with one major customer rather than selling individual seats. It always takes vision and in the case of Medavia, considerable political will to give birth to a new business. From the start it was clear that Medavia was never going to follow a text book “business model”. Although it received considerable support from its major shareholder at the time Libyan Arab Airlines, Medavia had to grapple with the problem that it had no specific nationality. In Malta, the chosen base for its headquarters, Medavia was considered Libyan. On the other hand, all flight operations were contracted in Libya and there Medavia was known as the ‘Foreign’ Maltese Company.